We Like Those Stinkin’ Badges! I was sick one day this week and instead of laying in bed binge watching Netflix I spent a good chunk of the day reading blogs on assessment. For the last year or so I’ve been trying out different methods for students to keep track of their own learning. I’ve been slowly moving my assessment techniques away from the standard unit test (too bad kid if you failed that test….try harder on the next unit kinda thing) to mastery learning and standards based assessment. I came across Alice Keeler’s blog and wow!!! she is a Jedi on Google! 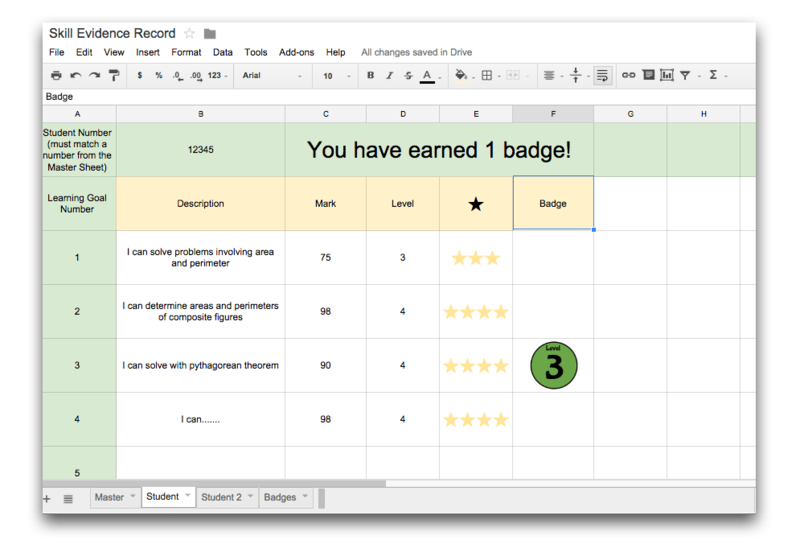 I especially love her google sheets for levelling up and awarding badges and Gamifying Searching Google Drive. I felt that a combination of these two ideas was exactly what I wanted. So again instead of watching House of Cards on Netflix, I modified Alice’s sheets to create a system that works form me. I created a Master List which will keep track of each student and their level/achievement on the expectations/learning goals. 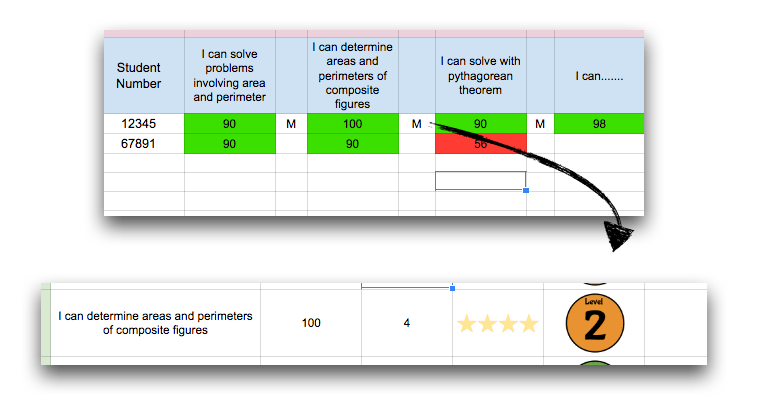 I created a Student tab/sheet which will show a student their current mark on each learning goal, the level (stars), and a mastery badge (if awarded). The best part about the student tab is that it is completely automatic. Everything on that tab is populated using formulas. The only thing I need to enter on that page is the individual student numbers. We will have weekly to semi-weekly “rolling” assessments. On each assessment I’ll assess up to 4 learning goals. For example, the first one it will be learning goals 1 through 4. The second assessment will assess 2 through 5 and so on. The second and third times assessing the same learning goal will include tougher questions. Every time a student does better on a learning goal they get the better mark. I go to the master sheet take out the old mark and put in the new one!! It magically shows up on the students score page. To get a badge the student will have to have demonstrated mastery of the learning goal. For me this is the student has demonstrated that they know the concept repeatedly. To award the student a badge I just have to put an M in the second column of the learning goal…..and voila! a badge shows up on the student score page! My students will have a visual record of their achievement. They can also request “upgrades” on any learning goal! They can set a date and time to come in and get another assessment testing that learning goal. Their mark should always reflect the amount of knowledge they know rather than the knowledge they know on test day. Check out the badges tab, Alice has included a ton of different badges. You could set up the different badges you want displayed. You will need to just edit the formula in the badges column on the student tab. (Do this before you make a copy for each student). Here are some samples of badges I’m creating to award mastery of learning goals. Currently my sheet is set up for 20 learning goals. If you need to add more, do it before you make copies for each student. Fill all the formulas down on the student page. Definitely go and see Alice’s blog and see what she’s got. [Update] Jan 27 2015- Kyle Pearce has taken this and added a ton of awesome stuff. I am now using his spin off. Check it out on his blog. [Update] April 19 2015 – David Griswold added some speed and functionality to the sheet. I am NOW using this version! [Update] Jan 28 2016 – Michael Matera made further adjustments which I am NOW using. [Update] Jan 2017 – I am now using FreshGrade. After showing Alice the new sheets she pointed me to her Template Tab sheet which will automatically create tabs/sheets for each student!! Awesome. Share the first student sheet by choosing publish to the web.. 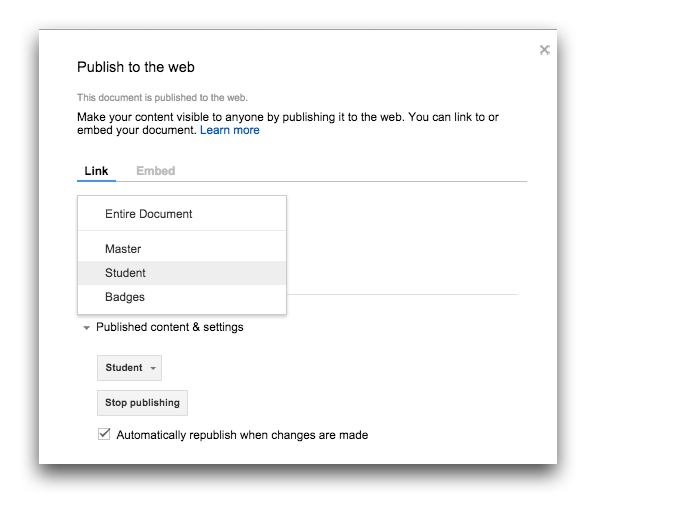 Choose the first student to publish and hit publish (Do not choose Entire Document). It will give you a link copy that link! 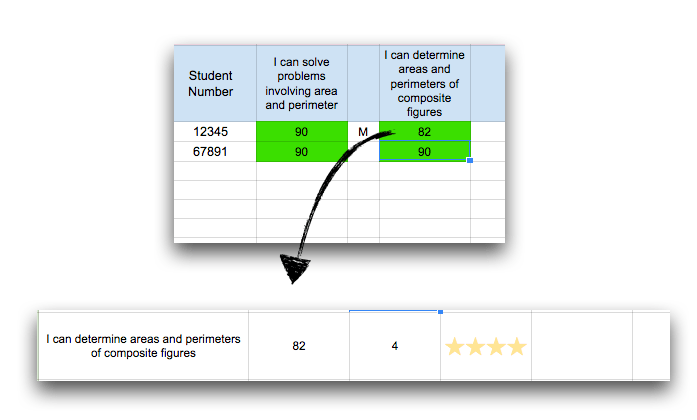 Create a brand new spreadsheet and paste that link beside a cell with the student’s student number. Repeat this for every student. I know it seems like a lot of work at the start, but that will be it!! 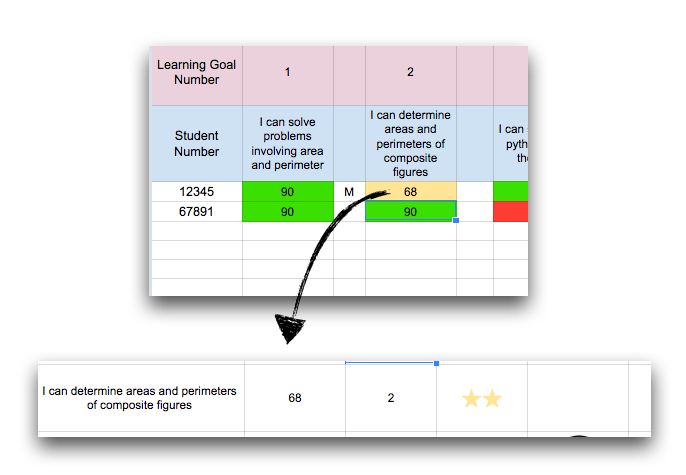 Now you can share that one document with your class and they can always access their score sheet! 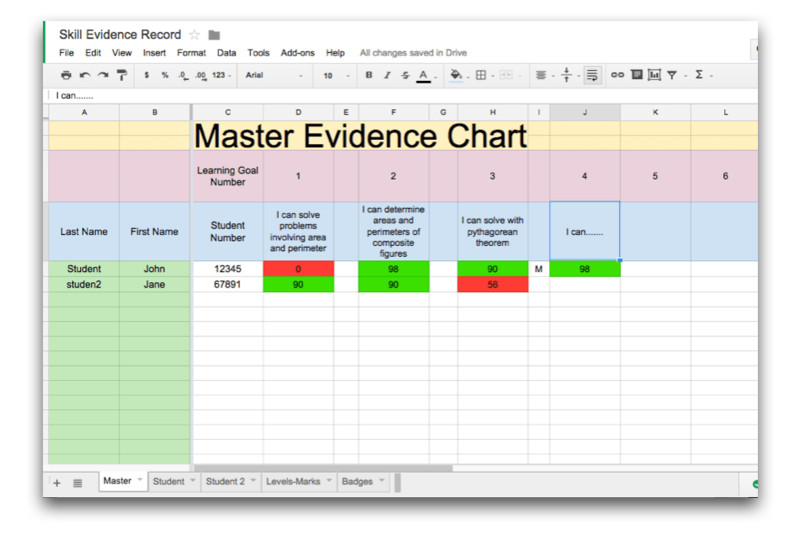 This puts my learning goal public google sheet to shame. Can’t wait to dig in deeper and try something like this. Thanks a ton for sharing what you learned! Jon, at first glance this looks amazing. I’ll have to dig in a little deeper later this week. Thanks for sharing! Very creative. Do you find any common characteristics of kids who are motivated or not motivated by the badges? Thanks Steve. I actually haven’t used the badges idea yet. Starting my new semester next week. I’ll probably write another blog post on my experiences. That last spreadsheet could email each student the link to their own tab using FormMule or Autocrat. That way, they can’t visit their friends’ pages. Aaah, great addition to the process Matt. Totally doing this too! I have a custom bit.ly link for each student by student number so they can remember their own URL. Seems to work well. I am looking at doing something like this with my 5th grade class for math. (I need something to motivate them and I think this is just the type of thing to do it.) Is FormMule easier to use then Autocrat to email out the individual sheets? I am trying to add images to the badge sheet. I am able to get the image URL in the B column, but I am struggling with getting the image in the cell in column C. The images are saved in my Google Drive. I am not sure if that is the issue. Any ideas on how to get the images into the cell? I tried that too! Those images have to be published to the web somewhere. I made a google site. Pasted the images on that site. Grabbed the url from there and it works. Nice share, Jon! looking forward to playing with this! I love your Mastery sheet! I used it with my 3rd graders for Math (Multiplication) standards. it made my life so much easier and the kids loved the badges. Even without any explanation, they figured out the higher their score the more stars popped up. I’m on my 2nd one now – Math again. I did combine it with Alice Keeler’s Template Tab and it worked beautifully! LOVE HER!! Keep those wonderfully creative ideas coming! If you need a “guinea pig”…just let me know! Thanks so much! Alice has some great work. It’s awesome to hear how you’re using it with primary! Would love to hear more. Thanks for laying the foundation for this! Much appreciated. The more I use Google tools the more my quality of life improves it seems like! Haha. Going to try this with Grade 8 math – just trying to figure out how to strand it…. I did modify the Micheal Matera version to create a strand based summary – Just have to look in once place to see the mark for the report card. Could be more efficient code, but it works. You can see the summary page here. Is there a way (that you know of) to publish individual student pages to the students in a way that they can make edits? I want it to be a place for them to put reflections in without creating a bunch of work for myself. 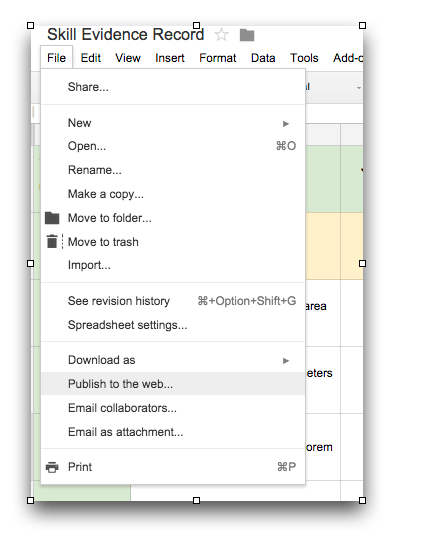 Yes…on the student page you can lock parts (cells) of the spreadsheet allowing others to be editable. You would then have to share each page as a file instead of as a webpage. So far this is the only solution I can find https://www.youtube.com/watch?v=Sj_uGLZqBmc Involves creating a new sheets file for each student. Locking sheets/cells only prevents editing not viewing. I can’t figure out how to just share a single page/tab anywhere…(sorry to bug you again). The above fix is doable, just a little time consuming. Are you only using freshgrade? So you moved away from the badges completely? Yes…I’ve moved into freshgrade and haven’t been using that spreadsheet. In freshgrade I can give different icons (stars, pictures,etc) that are like the badges. Love your work. Is there anyway that I can use your template AND run the Alice Keeler templatetab Add-On? Thanks!